What specific features and functionalities do you need to consider when choosing service business management software that suits your business? How Does the Appointment and Scheduling Section Work? Does the software allow you to schedule both one-time jobs and recurring jobs? For recurring jobs, what are the available frequencies? And what is the process for making these changes? Is it easy or difficult? Does It Include Customer Relationship Management (CRM )Features? It is one thing to record information about leads or customers, and another to turn that information into something really useful that will actually enhance you business processes. In his best-selling book on Sales, Swim with the Sharks, the author, Harvey McKay, recommends keeping as much information as possible about each lead or customer. That way, you can offer personalized service to your prospects and customers. He claims he sold to many hard nuts using his methods. We take that seriously in Scheduling Manager, our service business management software, and offer a wide variety of fields that can be used to keep information about each lead/customer, as well as several notes fields. This is really fantastic for customer relationships and allows you to maintain a history of every interaction with each prospect or customer. There are many dedicated CRM programs out there, including Salesforce, Sugar CRM, ACT, and many more. 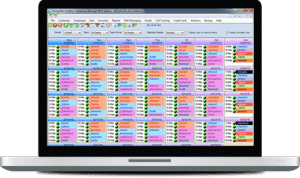 We include many of the premium features offered by them in Scheduling Manager, as an important part of a fully integrated service business management software package. What Accounting Features are Available in the Software? What are the various types of invoices that can be produced (one-time invoices, combined invoices, etc.)? Will the software interface with your accounting software? Does it perform batch-based transfers? Does it have real-time linking? What elements are linked/synced between the two? Will you be able to import existing data from your spreadsheet, accounting program, etc.? Can it export timecard data to your payroll program (ADP, etc.)? Payroll is very complex: different rates of tax for different states and cities, deductions for one thing or another, different rules about overtime pay, an so on. You must also take into account travel pay, mileage pay, and much more. Therefore, it is often best to interface with an external payroll service that will handle all of that for you, (including the W2s, 941s, and all the other forms at year end and quarter end). We don’t attempt to include all of that in Scheduling Manager, neither do many other programs. You need to make sure you have good timecard tracking software, which will help calculate gross pay and other payroll expenses.